When we moved into our house earlier in the year, the second driveway had a middle bit covered in pebbles. I had a suspicion of its use when originally laid, probably sometime in the 1970’s. Side tracked, I decided today to see how deep the pebbles went. Turns out they were only a few inches at best, and under that larger stones and rubble. Reminiscent of a child digging a hole for the heck of it, I spent the rest of the day excavating this long buried construction. For those who don’t have a clue what it may be, its a car pit. Being one who had grown up working on cars, I was stoked to find it. Now I just need to find something to do with all the rocks, and construct a lid (its about 5 foot deep)! Thanks! – yes, it is! 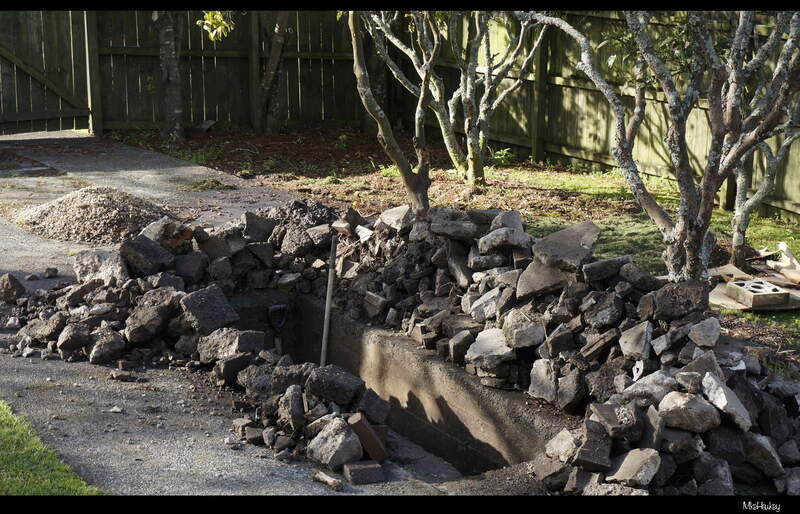 My imagination ran wild… I thought you found a body, treasure or a fall out shelter 😀 a car pit is much cooler though. Reminded me of the car pit in the old garage at my childhood home. I guess people changed their own oil (etc) in those days. Certainly have seen a reduction in the do-it-yourself mindframe I think. Its something I try to keep at though – now with the aid of a pit.